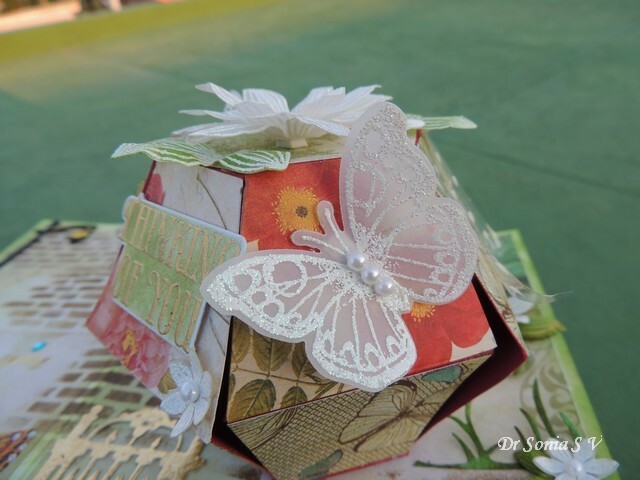 Making the hexagonal Pop Up ball using a template was cool but after getting a die cutting machine I found it tedious to trace and cut templates!This particular Pop up Card was made using a Pop Up Ball die by Karen Burniston. 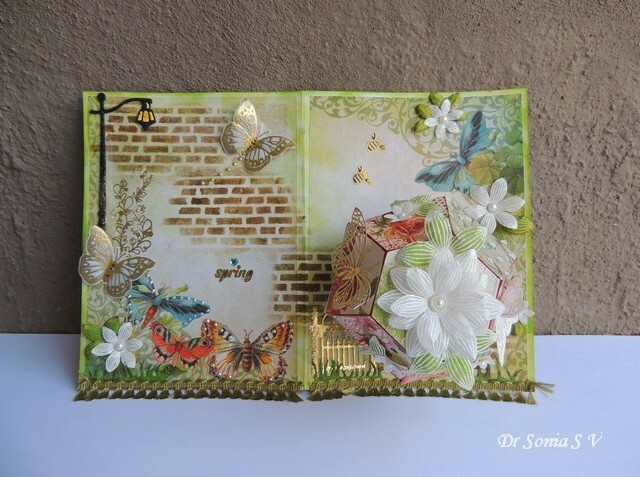 My Pop Up card has a spring theme and features heat embossed flowers[ heartfelt creations sun kissed fleur stamp and die set] and Sizzix and Cheery Lynn butterflies. 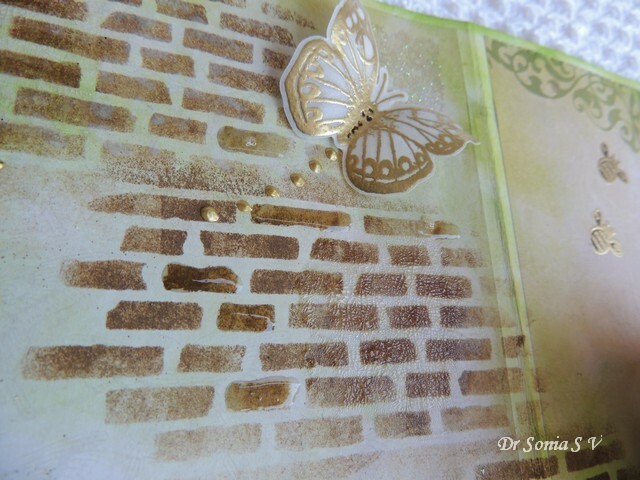 Used a Sizzix Brick die cut as a stencil to ink a brick pattern across the pop up card and added crackle paint and glossy accents to highlight parts of the brick pattern. 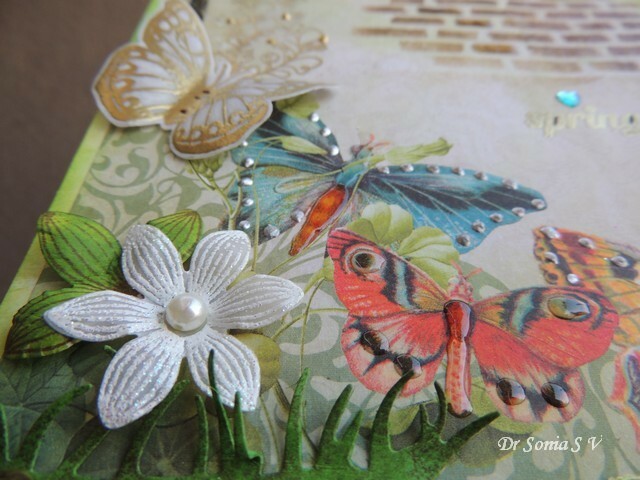 The glittery heat embossed parchment flowers are bordered by Cheery Lynn grass die cuts and I added liquid pearls and glossy accents on the butterflies. The golden heat embossed plant near the lamp post, the spring sentiment and golden heat embossed bees are all from a stamp set gifted by my sweet and generous blogger friend Lisa . 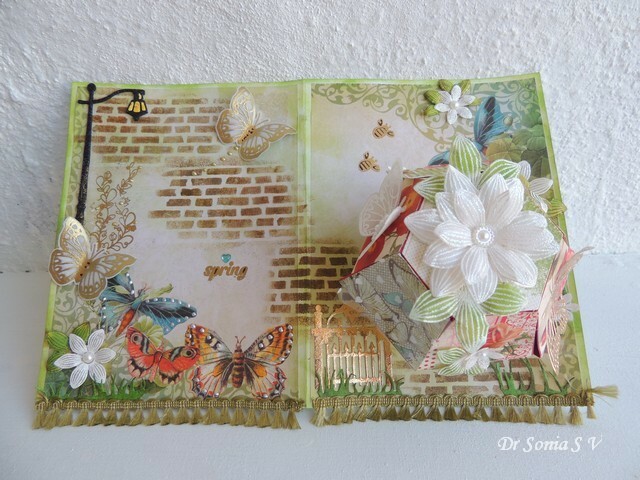 She also gifted me the glossy accents and the beautiful green lacy trim I used on this card.Thank you so much Lisa!! 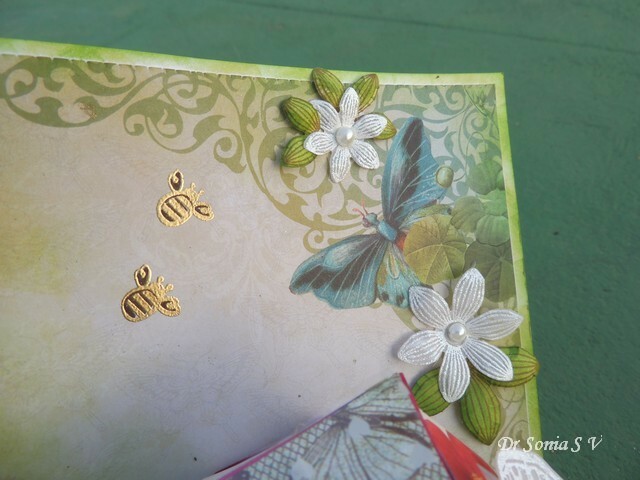 The white flowers and the white butterfly you see on this pop up card were all stamped on parchment and heat embossed. 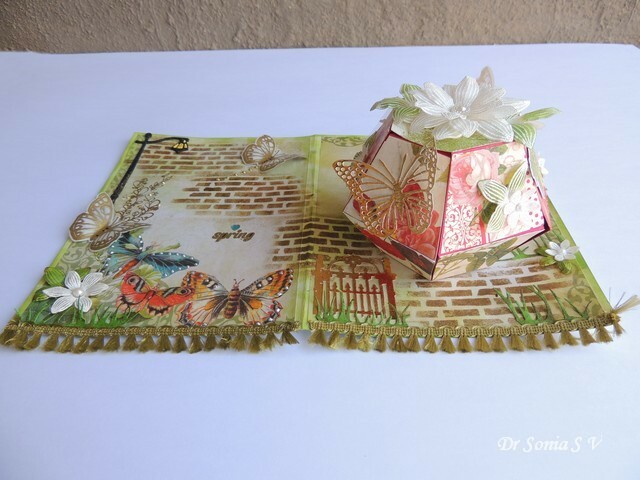 Parchment is much stiffer than regular velum and maintains its shape after bending or folding so your flowers/ butterflies wont become flat even if you add them inside a card. I also added a tiny golden gate at the bottom of my spring garden so that the spring fairies can enter and frolic around in my garden! The Pop up ball has 3 rubber bands inside and can be folded absolutely flat inside the pop up card. Another super cool thing about this design is that the Pop Up ball is attached to the base card with a brad so it also rotates.Here is the super short video showing how the pop up card springs open and the ball rotates. I hope you liked this interactive Pop Up card. 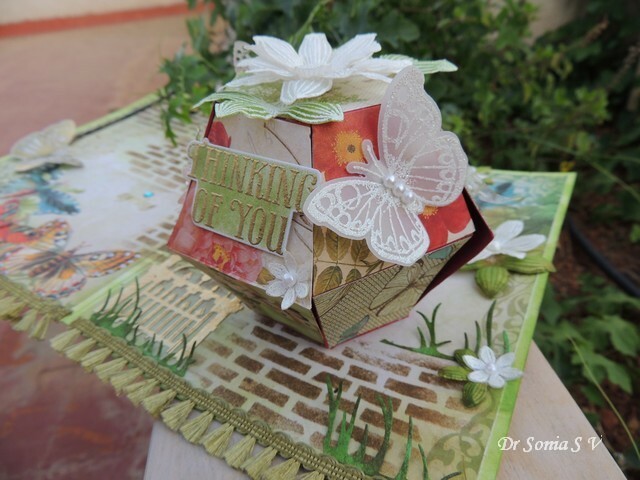 Edited : This card was featured By Karen Burniston on her facebook page..Woohoo..such an honor! 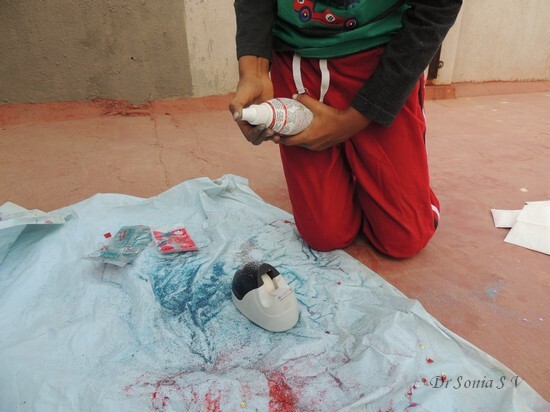 Hi friends I guess most of us have played around with clay at one time or the other! 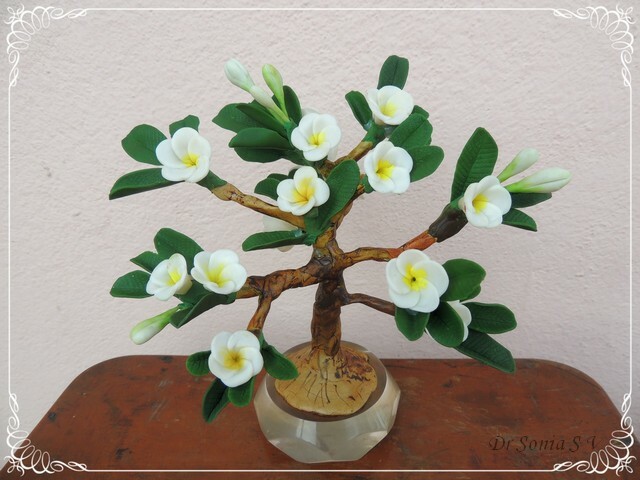 Last month a health scare mandated that I "take rest".Making clay Plumeria [otherwise called Frangipani] flowers and leaves to go on a clay bonsai tree helped me to "take rest" without going crazy! 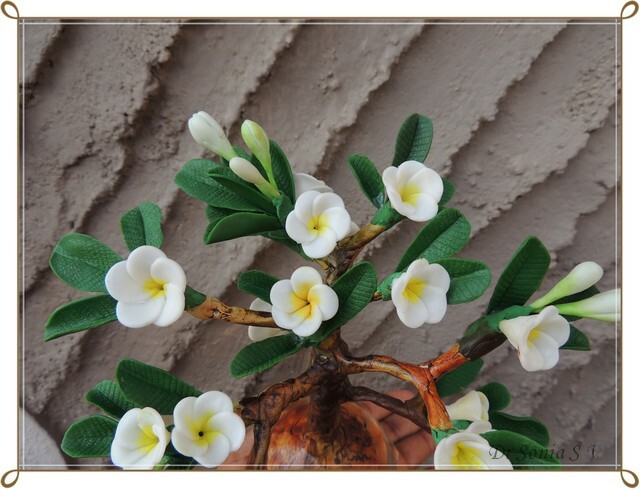 The Plumeria flowers and leaves were all made with Thai Clay, a type of air drying clay popular for flower making.My first experiment with Thai clay was a small Thai clay rose you can see in this post on an Altered Bottle.I find Thai Clay a challenging medium to work with and my little Bonsai tree has lots of amateurish imperfections but I hope you can bear with me! 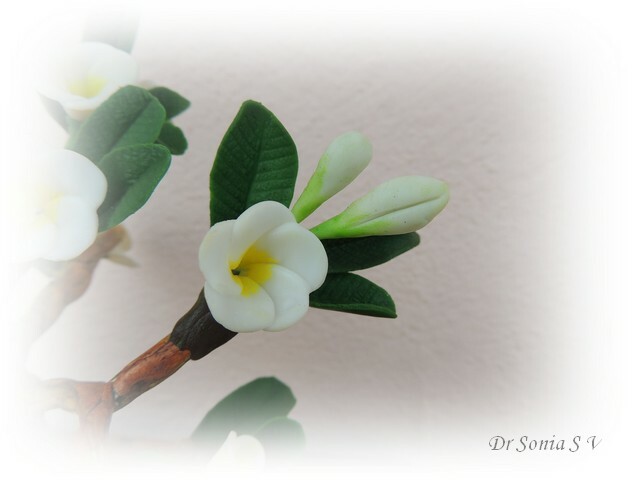 I used oil paints to ink the centers of my plumeria flowers yellow and the leaves were made by mixing green oil colors into the thai clay dough before shaping them into leaves and adding veins.Made the flower buds in white and used my finger tips to lightly shade them with oil paints[ I found I had better control using my fingertips than a brush]! I used wire to form the framework for the bonsai tree...in a similar fashion to how I made the Beaded Christmas tree and covered it with a tougher air dry clay called Mseal [you can read about Mseal here: Mseal tutorial ].Purposely added some cracks on the Mseal and finger painted it with different shades [brown and a bit of green and black] of oil paints to resemble a tree trunk. I am sorry I dont have pictures of how I made it...it was all an experiment! 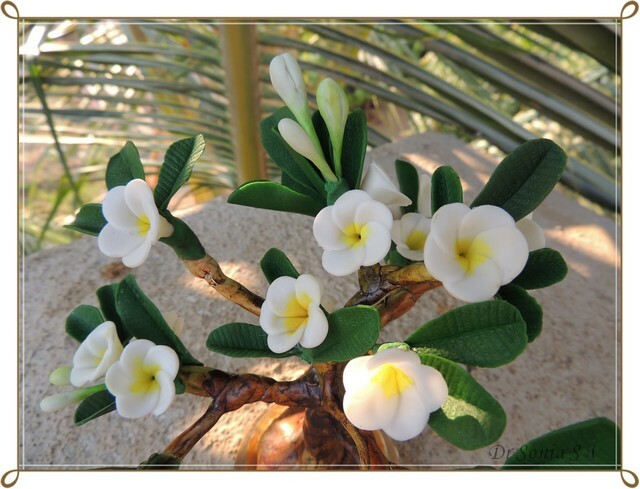 I love Plumerias and here in India we can see them on the roadside in many different colors! 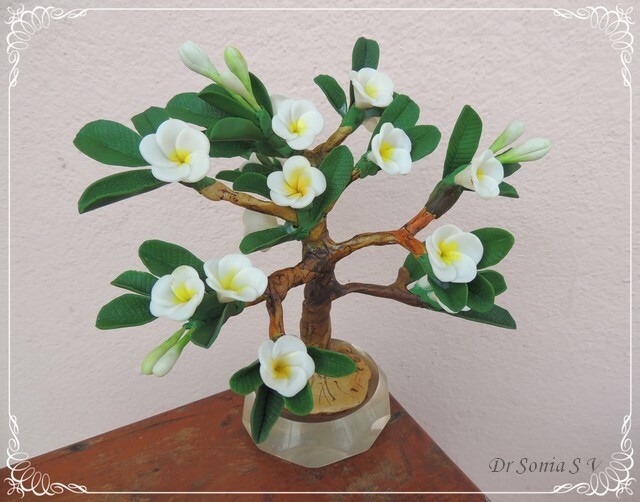 I hope you like my Clay Plumeria Bonsai ! 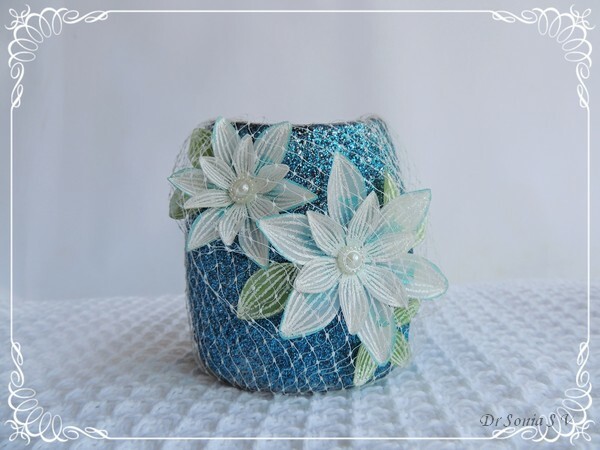 Adhesives are mostly just " glue" for a normal person but for a die hard crafter its so much more and I think only a fellow crafter can empathize with the anguish we crafters experience when we dont have the right adhesive for a crafty project and I think only a crafter will understand a whole post lauding a new "glue" ! 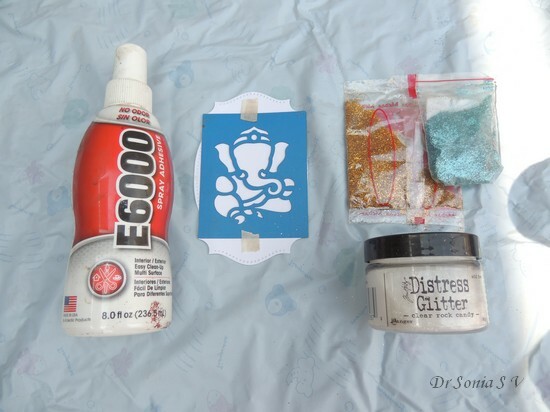 I was sent this bottle of E 6000 Spray Glue as part of my DT work for Crafters Corner and here is my review and a couple of quick technique tutorials using this glue spray. What is a spray adhesive...? Simply put its a glue you can spray on real quick and easy! 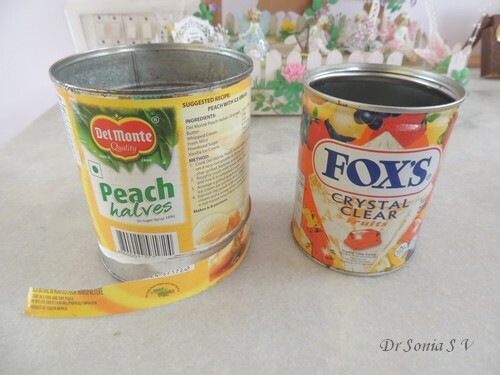 If you are like me and love spray painting you will understand my excitement when Shalini got spray adhesives to Crafters Corner ! 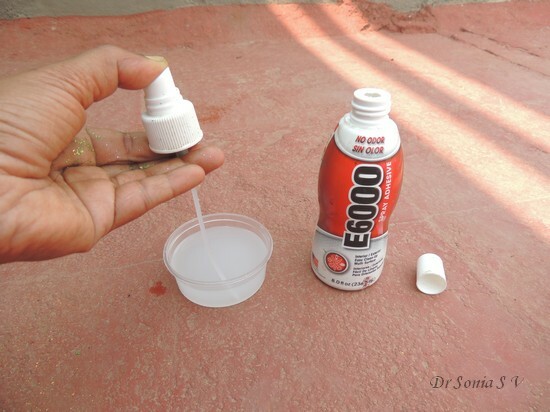 What is especially cool about E6000 Spray adhesive? Not all spray adhesives are the same. Many spray adhesives are toxic and I even saw one in the local market which even had a scary label saying it was inflammable! 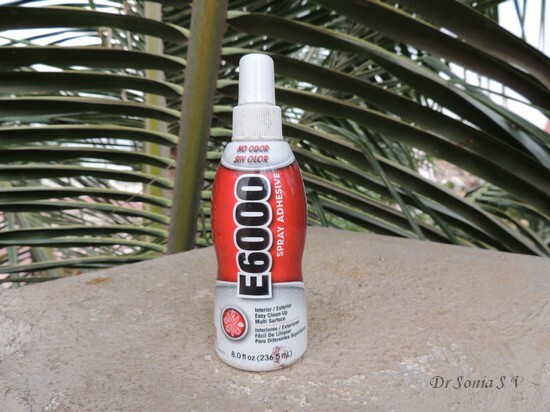 The E6000 spray is non toxic ,has no smell [ unlike the E6000 tube glue],and you dont have to use it outdoors [since most crafters work indoors this is especially advantageous! 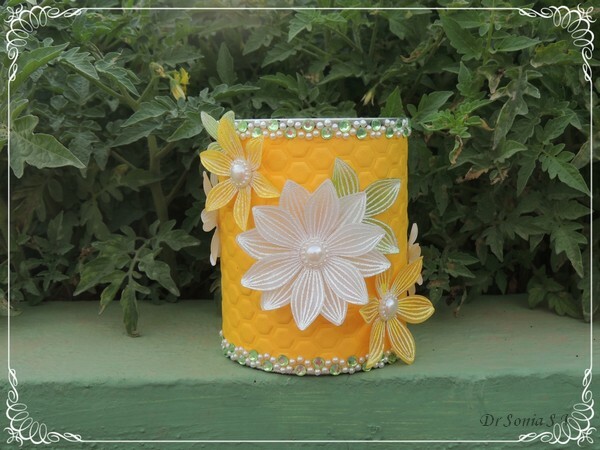 ].And the big plus point for me is you can use it with children around and yeah even little crafter can have a go at spray gluing as its nontoxic and so easy to use! 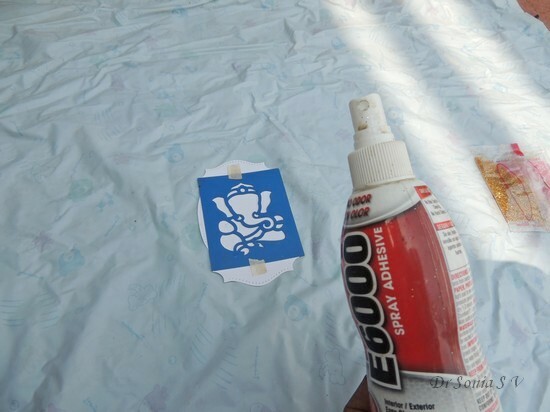 Keep your project to be sprayed on a plastic sheet to protect the surrounding area from the glue spray - the spray is like a fine mist and yes it will fall on adjacent areas but it can be easily cleaned with plain water if needed. Keep a glass of water at hand while using the spray. 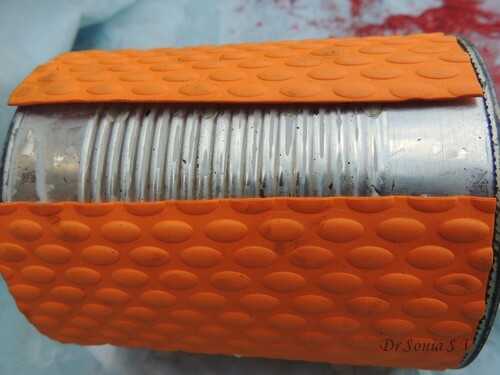 Once you finish using the spray.....unscrew the cap, dip the nozzle with the tubing into the glass of water and spray...the water will spray out of the spray mechanism and it will clean it so that your glue spray bottle nozzle does not get clogged. 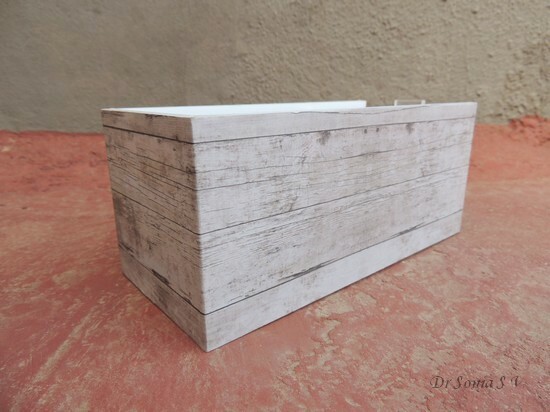 Drying time depends on the material you are using it on...metal and plastic can take hours to dry while paper dries in minutes. My little girl is ever ready to try out new products and she is the one who eagerly inspects all the DT goodies Shalini keeps sending us! 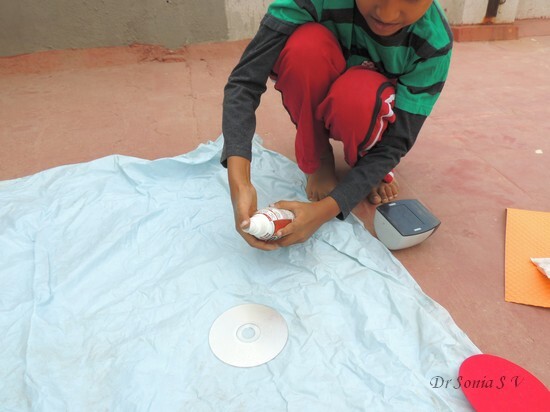 Spray the glue from a distance of 8- 10 inches from the surface. 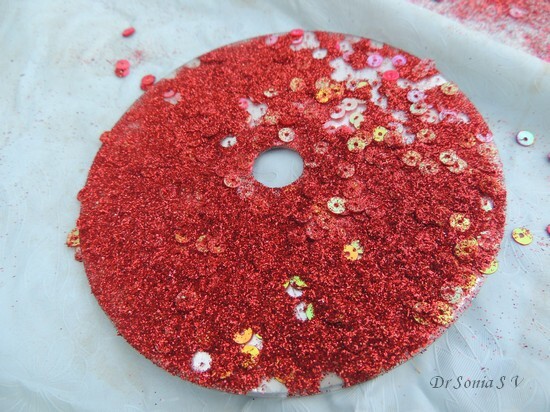 Here we chose the super slippery CD to glitterify! [yeah there is no such word as glitterify...but I am sure there will be in a few years time!! 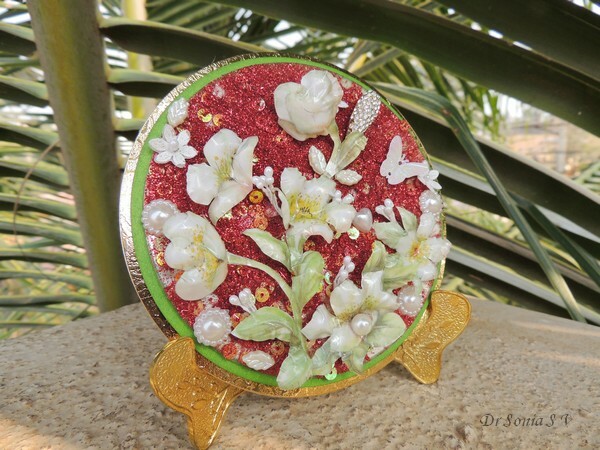 ]I originally wanted to stick on a circle of felt on to the CD but the felt seemed to slip off and we didnt have the patience to put a weight on it or allow it time to dry. So on went a generous sprinkling of glitter and sequins. Dont you just love the thick shimmery coating! But if you poke at it some sequins will fall off! Verdict- avoid sequin- glitter combination while spray gluing or alternatively spray between the layers.And glitter sticks better to paper and plastic than a CD. 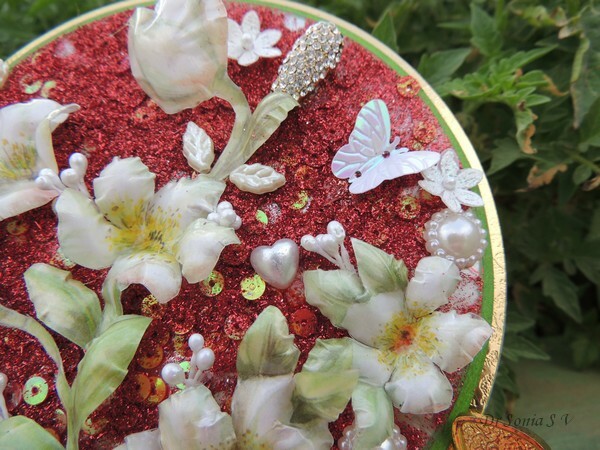 I added Sospeso Trasparente blooms and a few heat embossed parchment flowers and pearls to my glittery red background . My kiddo was quite critical of how this altered CD looked and kept suggesting how to improve it but try as I might it didnt quite reach her standards! 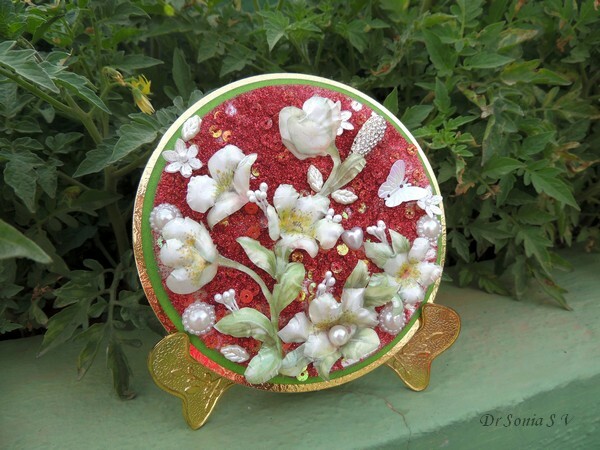 Many of us love beautifying objects we buy or have at home. 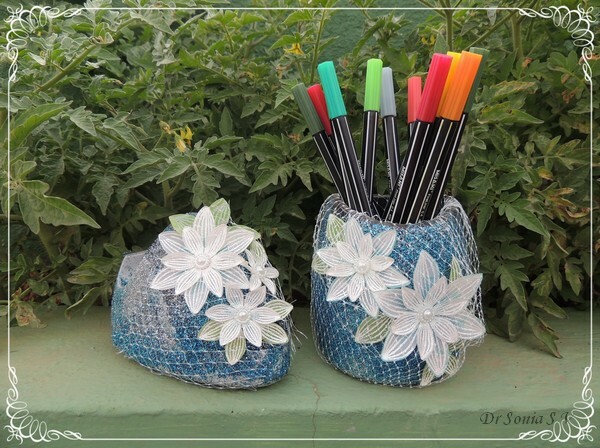 Covering with pattern paper and painting are the most popular ways to alter something but if the object had lots of curves regular gluing can be quite tricky . 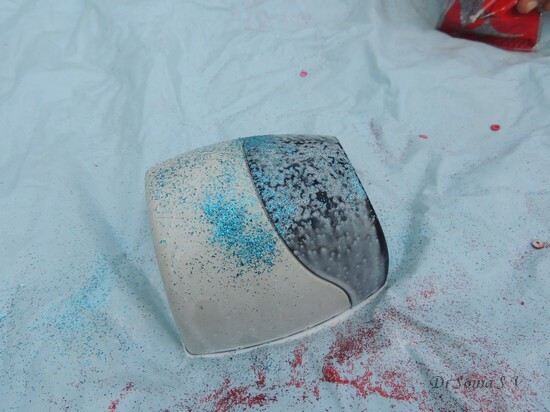 Here is the boring cello-tape cutter and pen-stand my kiddo and I altered using E6000 spray and good old glitter. 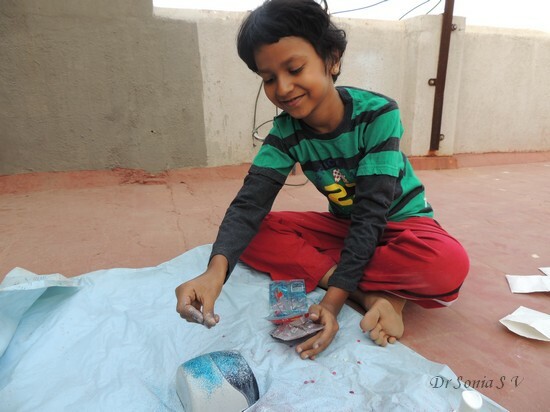 Here is my little crafter using the spray glue .When I spray paint I usually dont allow her anywhere in the vicinity so that she wont inhale toxic paint fumes but since the spray glue was non toxic I allowed her to use it to her hearts content! The glue dries pretty fast so you have be ready to sprinkle on your glitter on the sprayed surface! I love how the spray glue leaves a thin uniform layer of glue on the object it is sprayed on [ as you can see by the white film of glue in the picture above] and this helps to get a beautiful uniform covering of glitter. 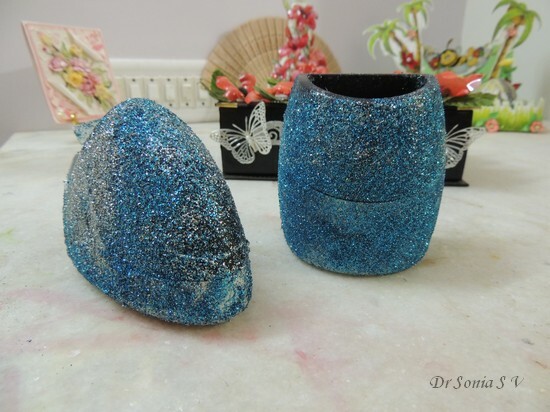 We used silver and blue glitter to get a 2 toned effect. 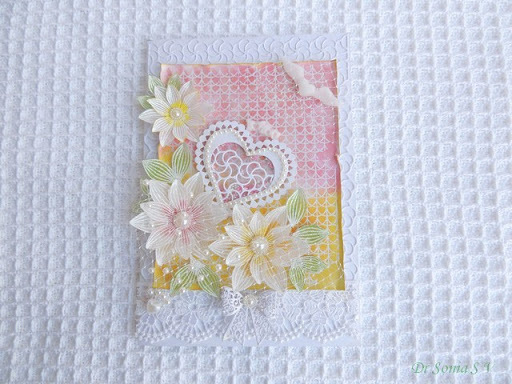 The heat embossed parchment[vellum] flowers were made using the heart felt creations sun kissed fleur stamp and die set. 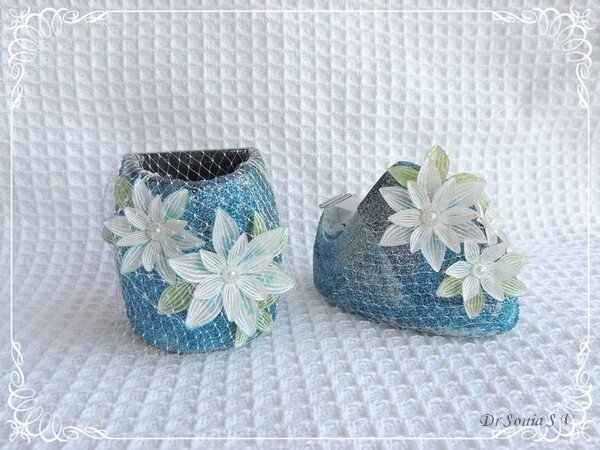 I inked the embossed flowers with distress inks to match the glittery blue background ! 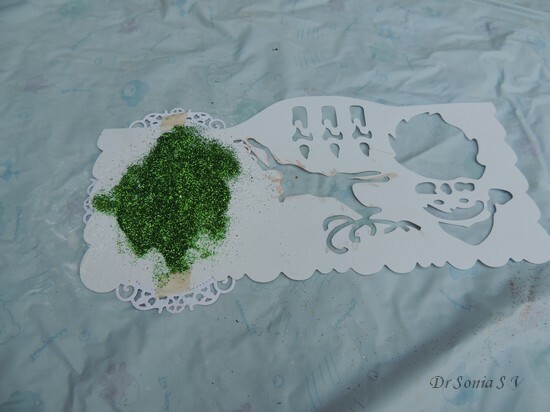 If you are a seasoned crafter you will be well versed with different ways to use stencils but if you are a novice here are 2 simple tutorials showing how to use Stencils: Stencil Art tutorial , Stencil Glitter Art tutorial . 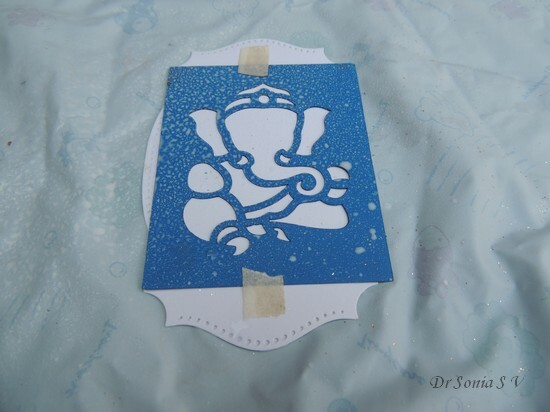 What is especially wonderful about using spray glues with stencils is its super quick and easy. 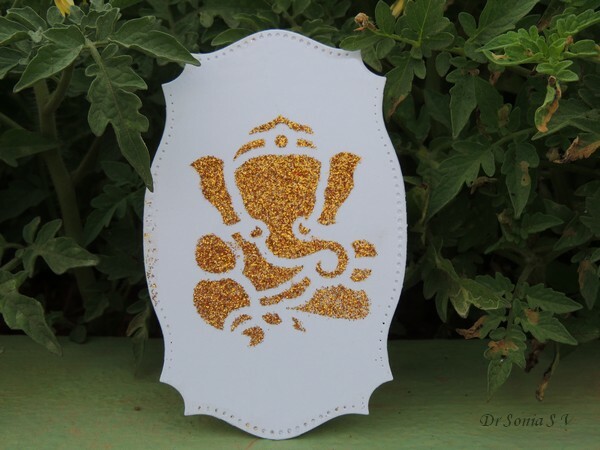 Though I have shown 2 small sized projects here , you can hand-cut / die cut or use store bought stencils to quickly decorate large surfaces for eg a birthday party. 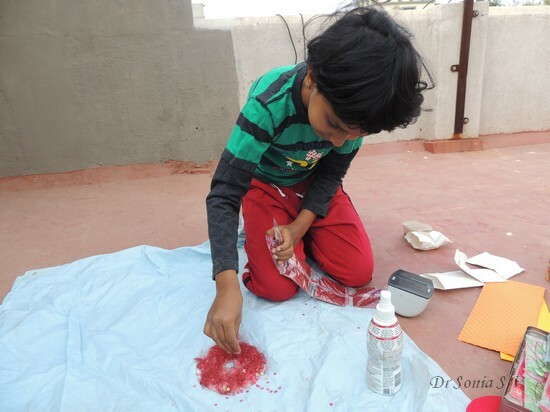 Wouldnt it be fun to stencil a child's name in glitter on balloons or banners for a fun birthday party...the ideas are unlimited! 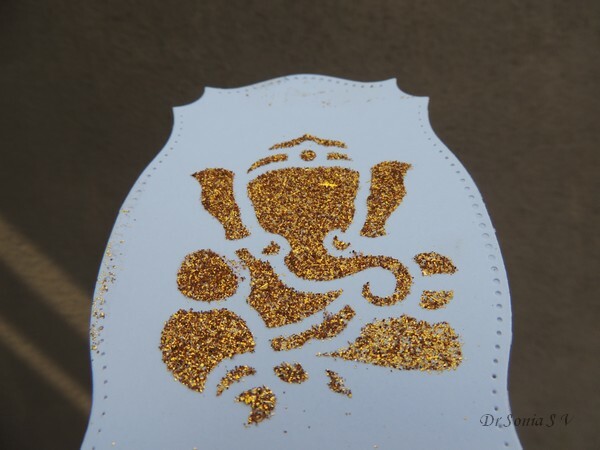 Tape the stencil to paper/ cardboard/ thermocol/ balloon or whatever it is you want to add glitter to . 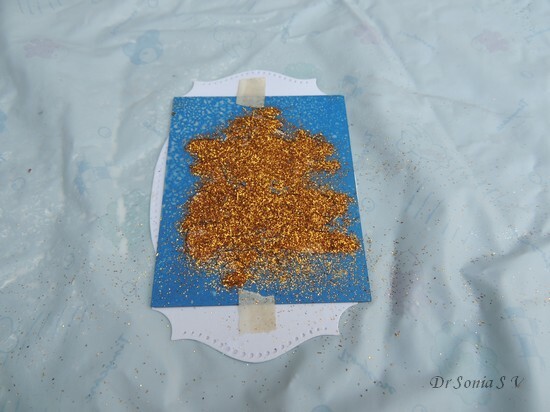 You can use any kind of glitter.....sophisticated glitters such as the yummy distress glitter I have shown above or local glitters for your first experiments. 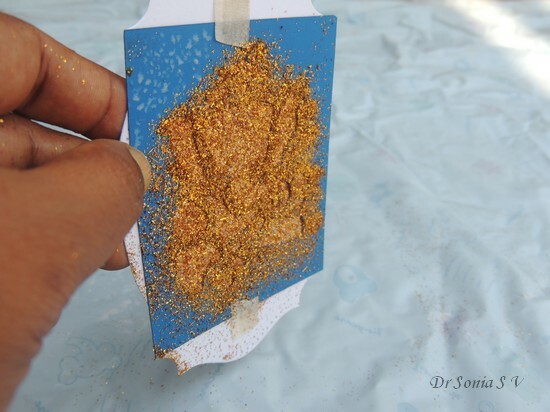 Place the Paper- stencil on a plastic sheet and spray from a distance of 8- 10 inches. I gave just 2 squirts and got a nice even coverage as shown below. 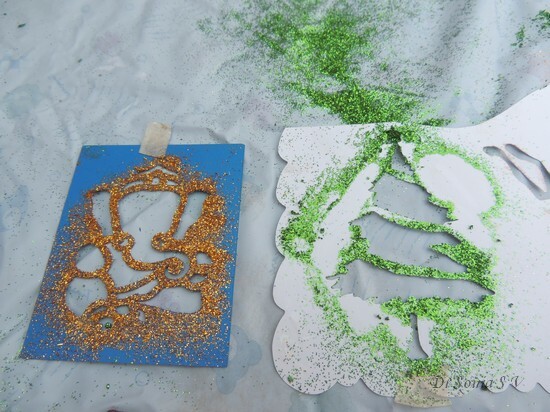 You can smear the glitter on gently with your fingers to help improve adhesion. 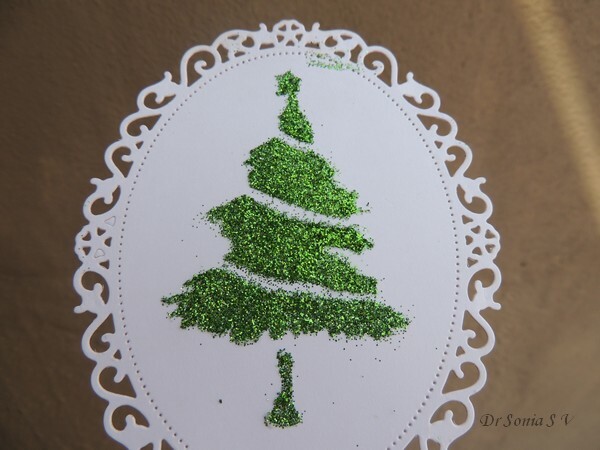 Tap off excess glitter and remove the stencil from the paper. 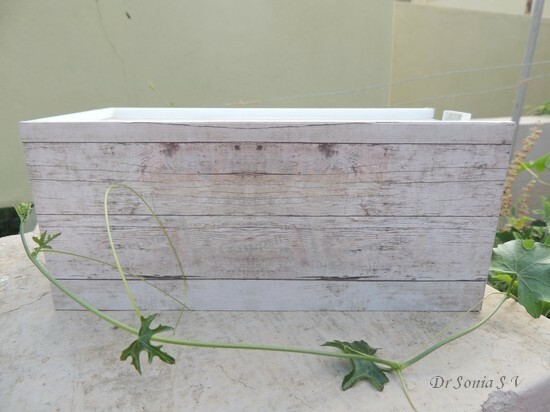 Here you can see the neat stenciling...no mess unlike liquid glue and it was so quick too! Since it was my first experiment and frankly I hadnt expected such good results I hadnt taken much care to mask off areas of the die cut , so if you look closely you can see glitter on the edges of my die cut where the spray glue had fallen and glitter adhered! 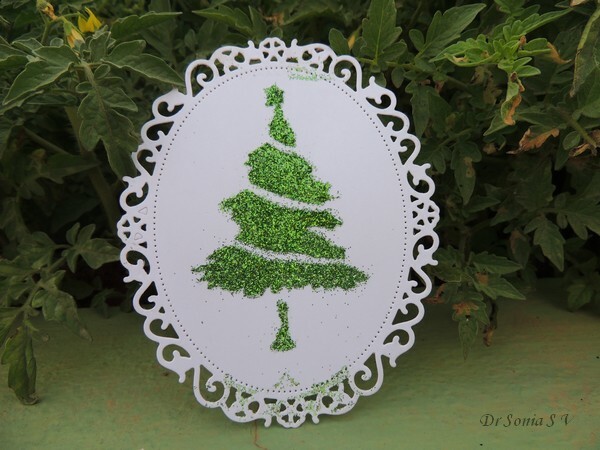 And since my first try turned out so good , here is another one using a Christmas tree stencil. 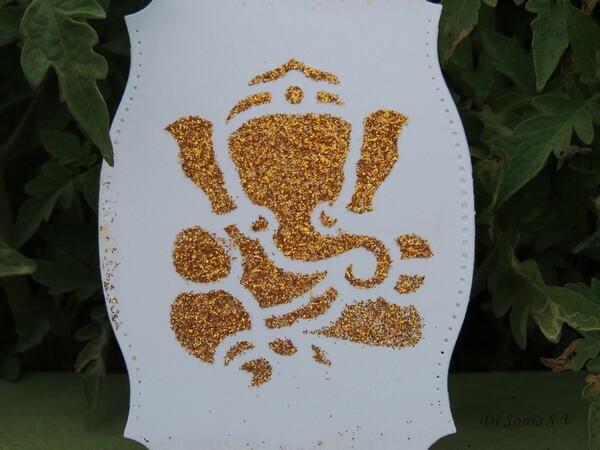 Tap off the excess glitter, whip off the stencil and "Ooh and Aah " at the beauty you created! Now a super important tip: Dont forget to wash your stencils quickly. In my excitement at the gorgeous results of my experiment I forgot about cleaning my stencils and found that the glitter had stuck on quite fast and strongly to the plastic surface of the stencil! I had to actually use a brush and vigorously scrub for several minutes before I could get the glitter off! Goes to show that the glue spray is pretty strong! 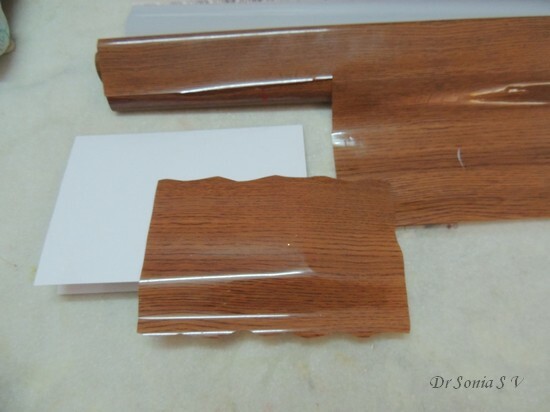 Spray glue is the ideal adhesive if you want to glue something super thin and flimsy such a plastic wrapping material or foil quickly and easily. You could use red tacky tape too for that but red tacky tape gives you no leeway..once you stick something on it...you cant change your mind and try and re-position it! With glue spray you do get a little margin of time to fiddle around with your positioning [ very handy for the perfectionist trait in all of us! 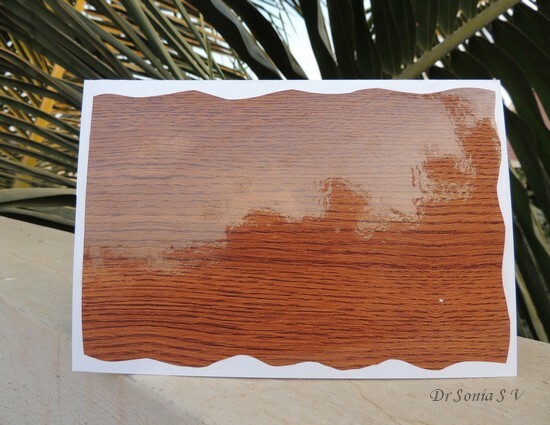 ]as it does not create an instant bonding but takes a little time like other wet glues. 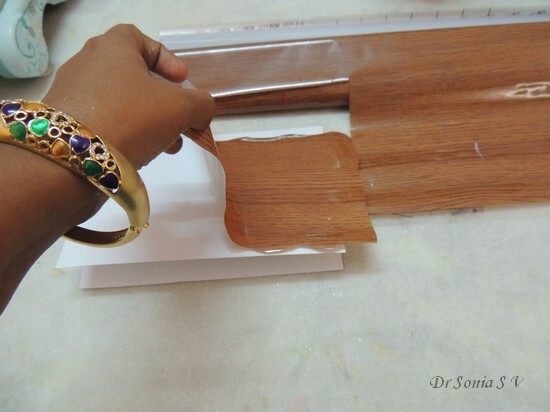 I had this roll of wood grain design plastic sheet which was so thin I really couldnt use it for anything apart from wrapping gifts[ a waste to use such a pretty design to wrap gifts! 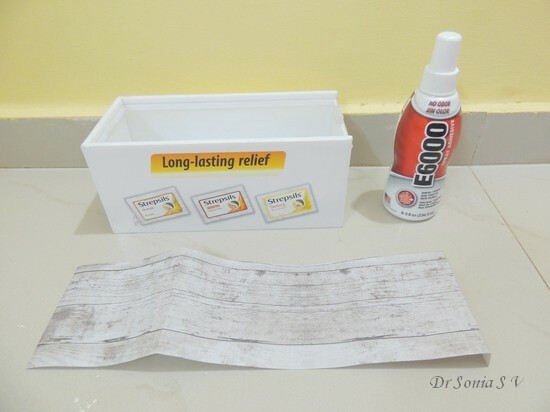 ]Sprayed the E 6000 glue on the plastic and gently stuck it on a sheet of card. 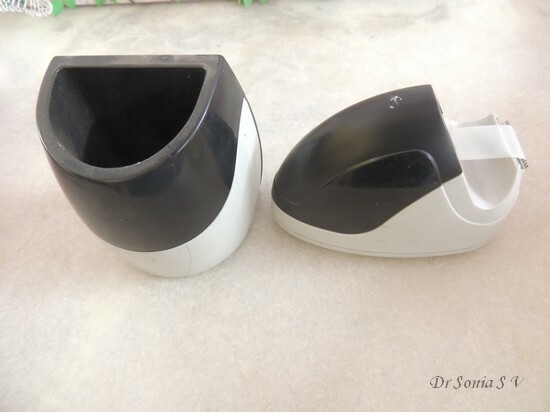 I was thrilled at how easy and mess free it was and I didnt even get wrinkles! This one is yet to be turned into a crafty project. In a review I like to share exactly what a product does so that when you use it you know exactly what to expect.In the picture above you can see the foam sheet lifting up at the edges and if you pull it at this point it will lift right off the metal tin.....well does that mean the spray glue wont work on metal...well NO...it works beautifully on metal...but you have to actually hold the surfaces together to allow it to bond! I was expecting a super quick adhesion like the red tacky tape forgetting that the spray glue is actually a mist of liquid glue. 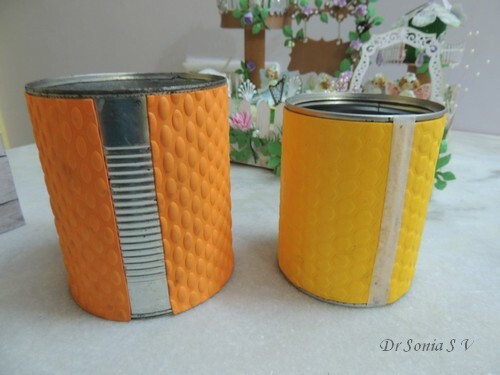 I used masking tape to hold the edges together in the yellow tin and just plain finger pressure on the orange tin and within minutes I got perfect adhesion. 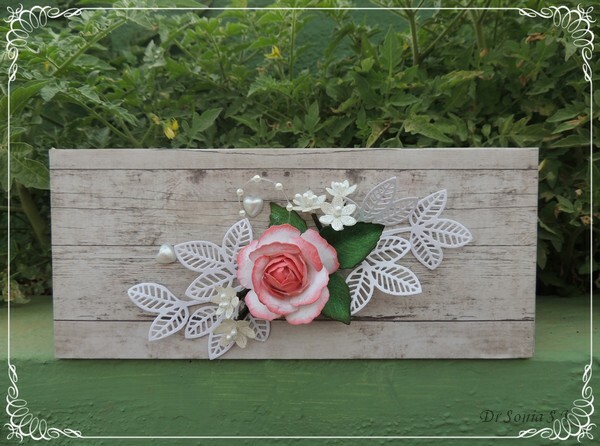 Added Parchment flowers made using my current favorite Heartfelt creations sun kissed fleur stamp- die set. 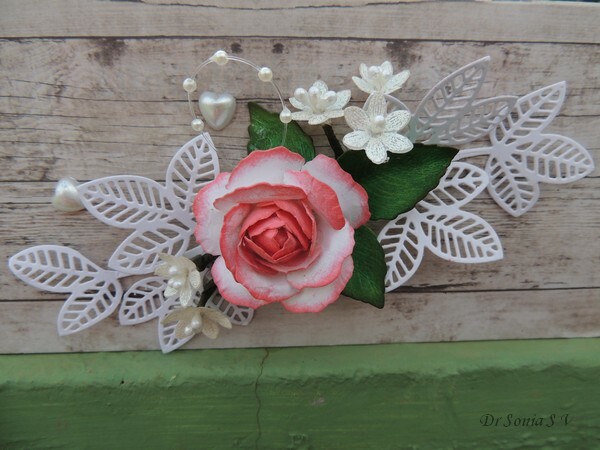 Nowadays die designs are becoming more and more intricate and beautiful but gluing them to your projects with normal white PVA liquid glue can be tricky especially if your die cut is white! 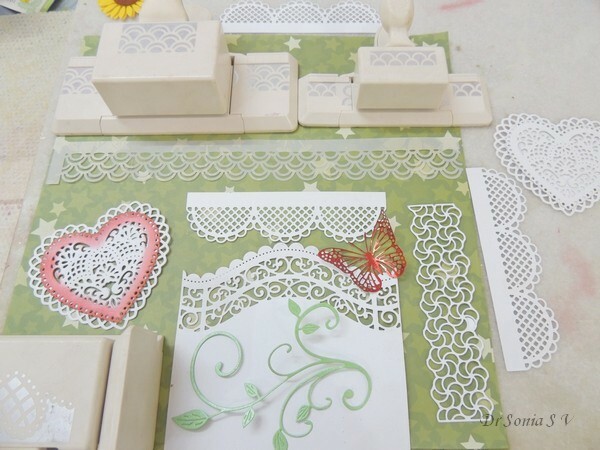 Gluing delicate Martha Stewart punch outs and lacy die cuts using regular glue can be so time consuming...you end up either missing lots of those delicate curves or end up squishing too much liquid glue which oozes out and leaves marks on your project when you stick it. 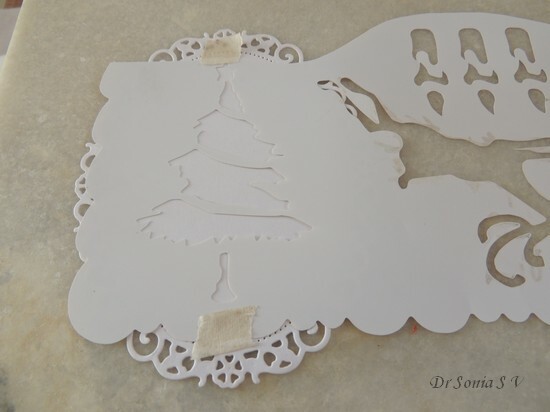 I am sure you have wished like me that there was an easier way to firmly glue down those delicate paper cut outs we all love. 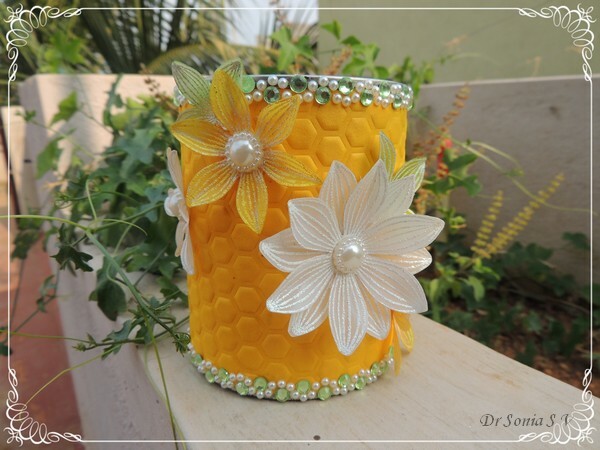 When you hear decoupage...the ever popular adhesive -sealant "modpodge" or other specialzed decoupage liquid glues come to mind! 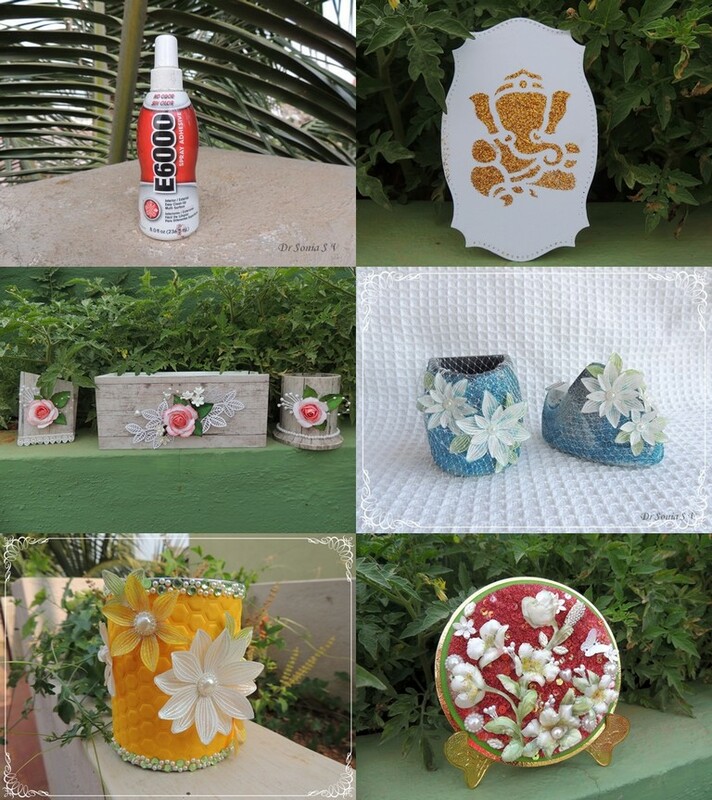 But successful decoupaging with Modpodge is a process requiring patience and finesse! 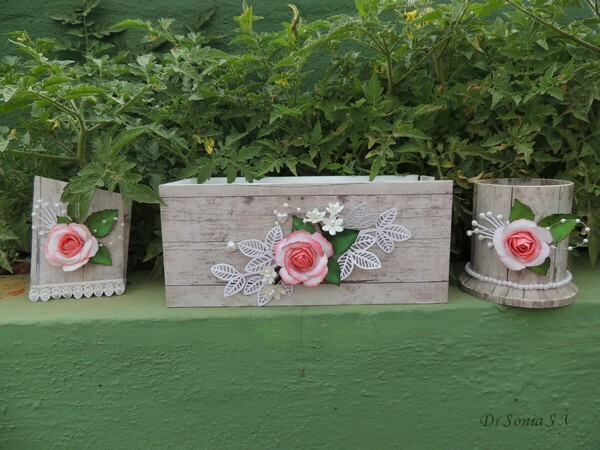 Well how about if you are in a mood for a quick decoupage session with minimal mess, no brushes and little fuss....get out your glue spray and spray it on!! 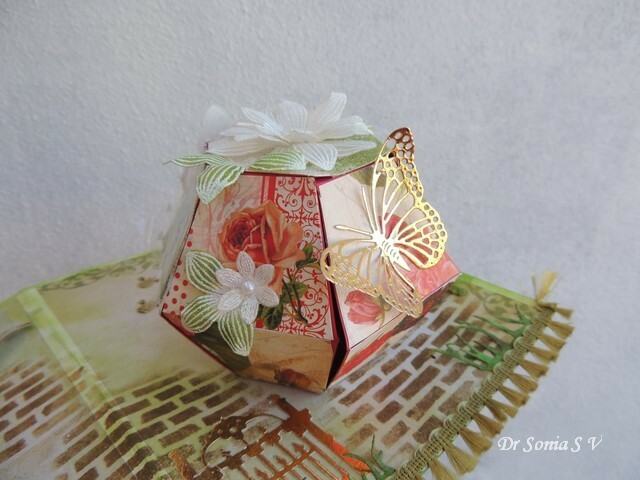 In this altered project I sprayed both the paper and the plastic box with glue spray and while I sprayed the paper I made sure I had a glue mist on all the edges so that it wouldn't lift off at the edges in future . 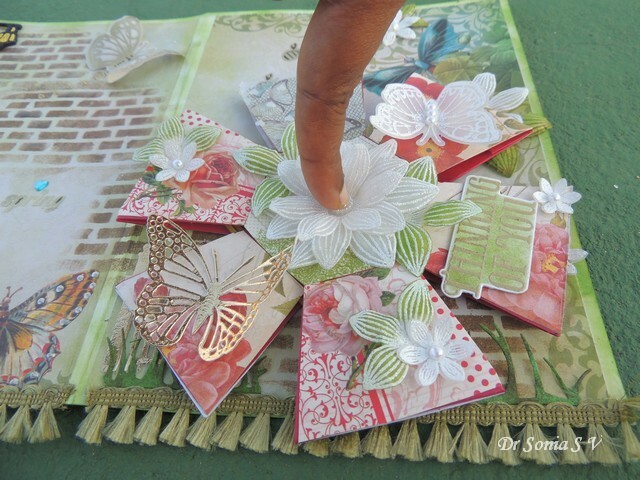 I used only my hands to firmly adhere the paper on to the plastic surface as unlike Mod podge there is not much liquid glue to squeeze out or wrinkle your paper. 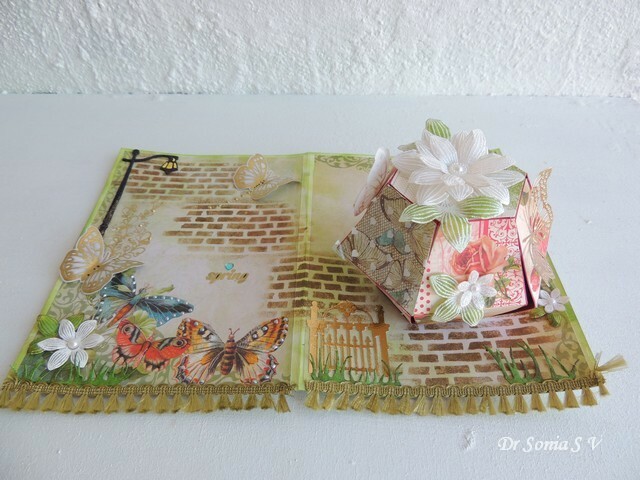 And here is the glue spray decoupaged box with matching penstand and paper holder decoupaged using modpodge...you actually cant make out any difference! 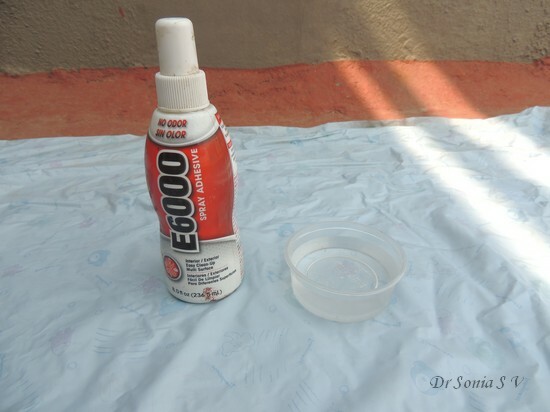 Yeah that's it for now folks...7 ways to use the Glue Spray E 6000. I do hope you enjoyed this lengthy write-up...do tell me how it is.